With just three weeks left in the 2017 NFL season, teams are beginning to narrow their focus and set their sights on Super Bowl 52 in Minneapolis. 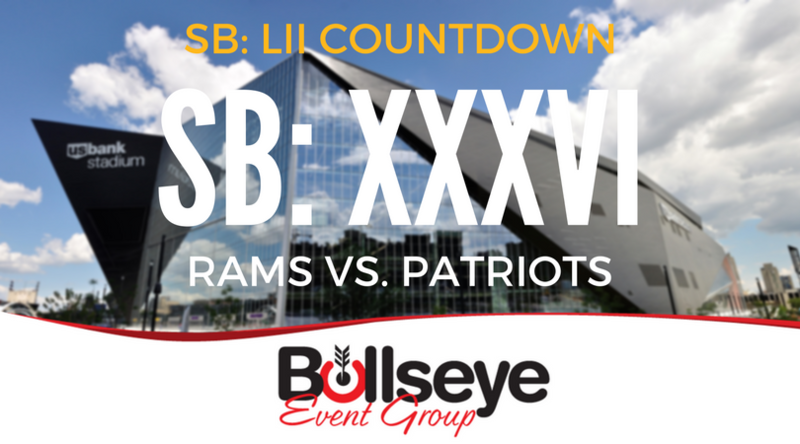 Up next; Super Bowl XXXVI between the New England Patriots and St. Louis Rams. Get excited for Super Bowl LII in Minneapolis! Book your five-star travel and hospitality packages today with Bullseye Event Group. Luxurious hotels such as the Hotel Ivy, Radisson Blu, Marriott AC Mall of America and the Marriott Towne Place Suites, a ticket to the 2018 Players Tailgate at the Super Bowl and more. Learn more about Bullseye’s complete Super Bowl LII Travel and Hospitality Packages today!